There is no two without three, and the third blog for The Huffington Post I wrote about chefs and design in Dubai, is a magical one. I really enjoyed meeting all three of the talented chefs, but Chef James impressed me with his kindness and humanity. 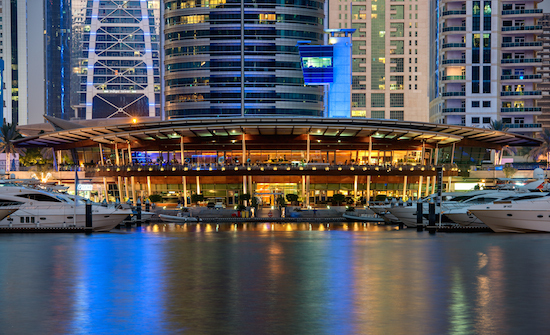 The Dubai Marina Yacht Club, seen from the bayWhen I recently asked three world-class chefs in Dubai to create culinary creations inspired by fashions discovered at the Vogue Fashion Dubai Experience, I did expect I’d get to peak into their kitchens. But I never imagined that I’d also get a wondrous insider’s look into their humanity. Chef Steve at The Palace Downtown Dubai, was inspired by the colors and cultural heritage of the African Java-print fashions by Dent de Man, while chef Abel at The Address Downtown found his inspiration within the structural look of a Max.Tan red mesh dress, thus recreating a modern take on the classic red velvet cake. The reason I love doing what I do so much is because I often get to the heart and soul behind film, food and fashion. Think of it as a direct, private line to the men or women behind glitz and glamour. Even with celebrity chefs, artists, fashion designers and movie stars, their humanity is what interests me most. 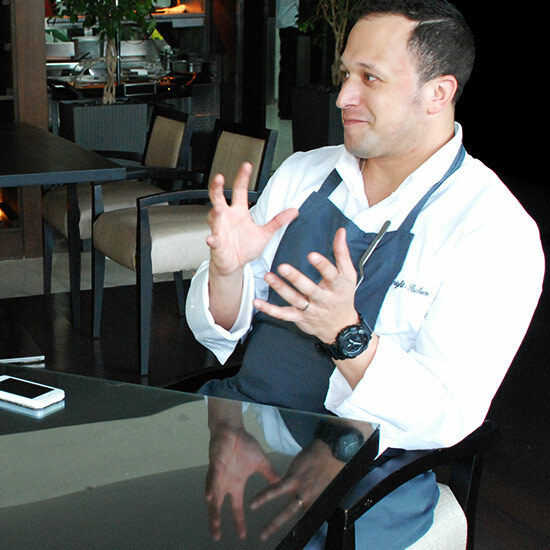 And what wonderful warmth and candid intelligence I found in the figure of Executive Chef James Knight-Pacheco at the Dubai Marina Yacht Club! 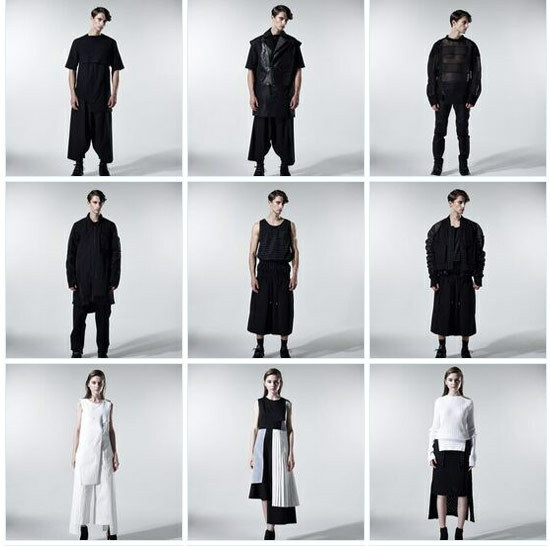 His interpretation, of the black and white structural looks created by Korean designer Byungmun Seo, went straight to the form of both fashion, and food. He overstepped the obvious, color (or the lack thereof) to discover the essence of the composition. What a beautiful experience this all turned out to be. When I say “only in Dubai” I mean it. I love the grandness of this place, and those who understand it best are those who possess a spirit of discovery. One only has to sit perched on the second floor terrace of the Aquara, chef James’ first class restaurant inside the Dubai Marina Yacht Club — overlooking the water dotted with multi-million dollar boats and framed by the impossibly high buildings of the area — to understand why. Perhaps, if there is one thing these three great men I got to interview last week have in common, and whose culinary generosity I thank for the extra notch I’ve had to begin using on my belt these days, it is their pioneering spirit. Dubai is a city that can boast over 6,000 restaurant, nearly 14 million visitors a year, and still doesn’t have its own Michelin guide. It was chef James who brought this important fact to my attention. In terms of world-standing, Dubai is still a baby on the global foodie map. Sort of like NYC pre-2005, the year when the first US Michelin guide, focusing on the City, came out. I often draw parallels between Dubai and the Big Apple because I truly believe there is something about this city borne out of the desert, with a thirst for the future and a hunger for glamour that truly feels like NYC in the good ol’ days. This entry was posted on Saturday, December 5th, 2015 at 5:11 am and is filed under Food, Interviews, Man's Opinion, Style Icons, Woman About Town.